And I did a lot of searching for fabric. I found a great deal on the Dwell fabric on this website: http://www.onlinefabricstore.net/ in case you wanted to get some of your own. Someone also asked if the fabric is durable. It's an upholster grade fabric and is made of cotton. I haven't had it that long so I'm hoping it lasts a long time and continues to look good. I'll probably spray some Scotch Guard on it to protect it from stains. I'll give you any updates as they come! Ok, enough talk down to business! I started with some old sheets I bought at Goodwill. I wanted to make a templates to use for cutting out my nice fabric. Since I'm a first time slipcover-er I didn't want to waste precious fabric with mess ups. 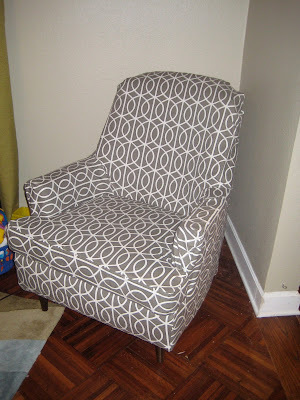 I cut large rectangles out, then fit them snuggly around each section of the chair, pinning as I went. I wanted the original shape of the chair to show through so I pinned as closely as I could around the edges. After I did that I trimmed any extra fabric edges to get about a 1.5" seam allowance I would to for my templates. I marked the templates so I would remember where each one was supposed to go. I then used my templates to cut my Dwell fabric out. Using the sheet templates allowed me to line up the pattern how I wanted. 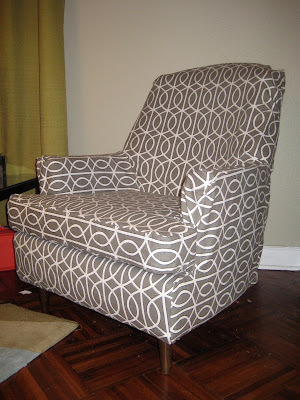 Then I repinned my new fabric templates inside out on my chair to get my slipcover shape. Then sewed the whole thing up. 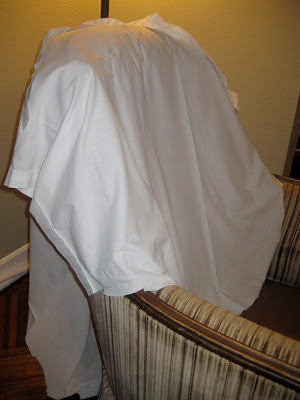 It was a little cumbersome with all the fabric laying everywhere but I was afraid to unpin anything and loose my shape. After I sewed it all up I refitted it on the chair to see how it fit. I pulled out a few seams that could use some refitting and stitched up a few spots that I had trouble getting the first time around. The arm for example I pinned again and resewed. 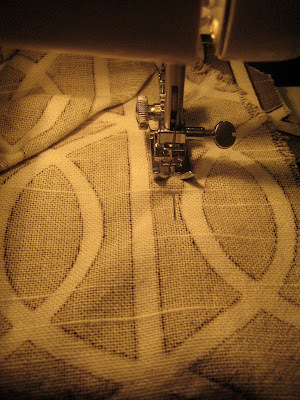 Then is was time for the cushion, I thought that since I have done a few pillows in the past this would be easy. But it was time consuming and hard. I traced the shape of the cushion onto the fabric leaving a 1.5" seam allowance. To get the fabric allowance for the middle cushion thickness I used a piece of string and ran it all along the edge. Then laid it out on the fabric, measured a few inches on either side, and cut it out. The hardest part was sewing along the T-Shape of the cushion. Other than that it wasn't bad. 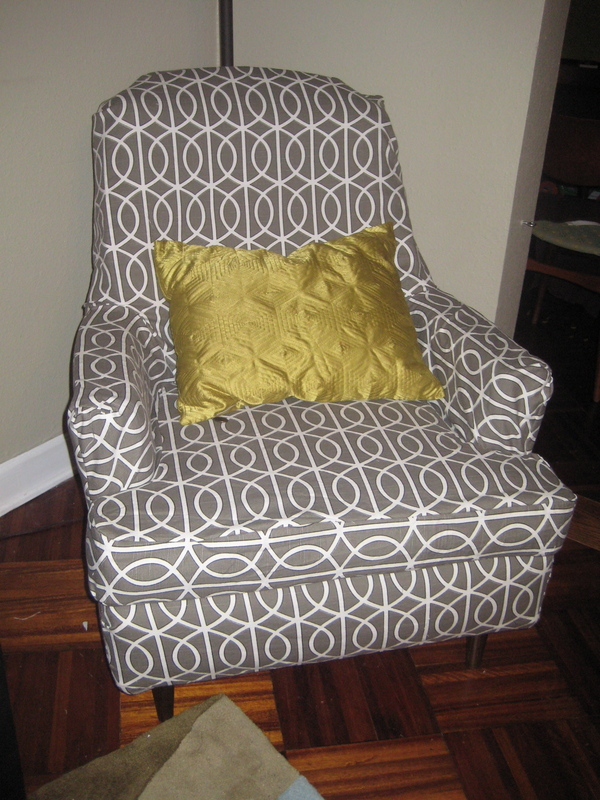 I then pinned the fabric around my cushion in the same fashion as I did the chair, leaving an opening in the back. Once I finally finished sewing (I've never sewn this much in my whole life!) I got to work on the bottom. First I cut off the outdated skirt. Originally I was going to staple the fabric to the underside of the chair to give it a more upholstered feel. But in the end I just used pins to adhere it so I can take the slipcover off whenever it needs cleaning. Though the pictures don't show it I ended up sewing a piece for underneath the cushion using some leftover sheet fabric. Then I was all done! I hope this has been helpful and gives anyone who was thinking of trying this themselves some courage. You can do it!